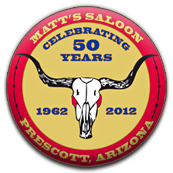 Matt’s Longhorn Saloon has been a part of Prescott’s famous "Whiskey Row" since the early 1960’s and is still going strong today as one of Prescott’s last true Honky Tonks. 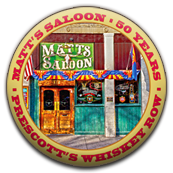 Occupying the historic D. Levy Building, built in 1901 as a mercantile, then becoming a saloon just at the end of prohibition in 1934, Matt’s Saloon has become an internationally recognized and highly acclaimed destination place for country music. Great country western acts such as Buck Owens, Lee Hazelwood and Waylon Jennings entertained Matt’s customers in the early to mid 60’s and more recently, in 2003, Andy Griggs and Leland Martin performed. Even legendary rock & roller Bruce Springsteen has a special connection with Matt’s Saloon. ... you just tell 'em at Matt’s Longhorn Saloon. Matt's Saloon: Now & Then! 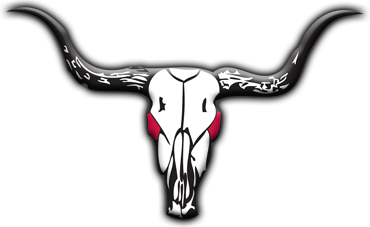 © 2019 Matt's Longhorn Saloon. All rights reserved.